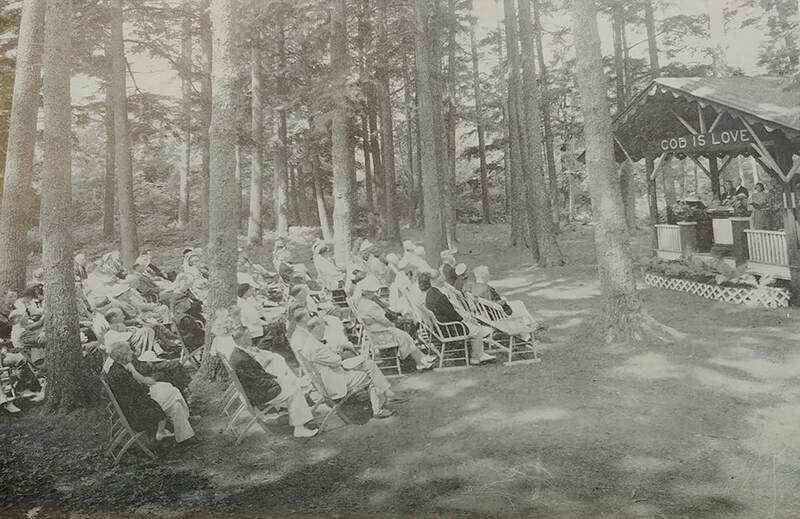 In 1901, a Universalist minister wandered into the wooded pine grove at Ferry Beach and knew it to be a magical place where people would gather together for centuries for rest, relaxation, reflection, and renewal. ​First Universalist Summer Meeting held under leadership of Dr. Quillen Hamilton Shinn at Methodist summer quarters at The Weirs in New Hampshire. ​Summer Meeting site moved to Saratoga Springs, NY and Dr. Shinn begins his search for a permanent site. ​Dr. Shinn located Ferry Beach site. The twentieth annual meeting held here as guests of the Boston and Maine Railroad, owners of the property. Fundraising efforts begun to make purchase of the property possible. ​Ferry Beach House purchased from the railroad and renamed the Quillen. ​Summer Meeting Association incorporated and renamed the Ferry Beach Park Association of Universalists. ​Underwood House built and named in honor of Carrie P. Underwood, a benefactor of the Beach. ​The Grove purchased from the railroad. ​Rowland Hall built and named in honor of Dr. William R. Rowland, president of the Association from 1919 until his death in 1925. ​Claflin Cottage purchased and named in honor of Edward P. Claflin, a former board member and a benefactor of the Beach. Gardiner Cottage purchased and named in honor of Marion L. Gardiner who bequeathed funds for its purchase. ​Rose Pavilion built in the Grove and named in honor of William Wallace Rose, minister of the Lynn (MA) Universalist church for 30 years. ​Quillen Lobby remodeled and dedicated to Edward Hempel, longtime treasurer and Executive Secretary of the Association. Sand dune restoration project begun. ​Capital Fund Drive held; Manning Cottage purchased and named for Robert Manning. Cottage has since been sold. ​Dining Room built and named in honor of the Rev. Earle Dolphin, longtime Ferry Beacher and resident musician. Health Center and Children's Room relocated and renovated; sewer connections completed for all buildings and Grove sites; the Stone Environmental School begins renting the property in the off-season. ​Rowland Hall remodeled and other major improvements undertaken to meet fire codes. Construction continues to date as we continue to meet fire codes and safety requirements. ​Ferry Beach Ecology School begins. ​Completely remodeled Quillen from top to bottom, including accessible bathrooms and a new lobby. Built a new store at Claflin. ​Created the Memorial Garden, built Kelley Cottage – a “green” building and the first new building at Ferry Beach in over 30 years. ​Built a handicapped accessible bathroom in Underwood, renovated the tennis/basketball court, renovated both Grove wash houses. ​Renovated the Eleanor B. Forbes Chapel in the Grove, thanks to a generous donation. ​Built handicapped accessible ramps and walkways at Underwood and Gardiner. ​Commenced improvements envisioned within the 2nd Century Fund Capital Campaign, beginning with the fortification of our primary dunes. ​Remodeled the Rowland Hall dormitory space. ​Began site excavation and foundation work for new Metz Village, Dining Hall, and Nurse's Cabin. DeWolfe Dining Facility and Metz Village complete. Nurse's cabin settled in new site. All of the premium housing: 5 Morris, Claflin, Metz cabins, and Kelley renovated and refurbished, turned into guest housing (from staff housing) in the summer months. This created funds as well as demand for more premium housing. Board of Ferry Beach decided not to renew the contract with our long term tenant, the Ferry Beach Ecology School later named The Ecology School. Contract will end at the end of 2018. The Ecology School had been a part of Ferry Beach for about 20 years. Hopkins’ house renovations turned home into 4 bedrooms with 4 private baths, 2 completely handicapped accessible. Renamed John Cross Cottage in 2015 in honor of Tom Alison’s partner John Cross. John’s legacy gifts to Tom has made it possible for Tom to support Ferry Beach. Renovation of Quillen bathrooms, hallways and light fixtures. Renovation of bathhouse in back of Grove. Roof replacements from 2014-2017 on all major buildings. ​Metz Family (Bill Metz, Elizabeth McNab and Margaret Munroe) name themselves the caretakers of the Metz Village and contribute regularly to the upkeep of the property. They encourage Ferry Beach to set aside 10% of proceeds to upkeep of the cottages. Board adopts a new mission statement, reflective of the changes made by the UUA to disaffiliate all camps and conferences in 2005. ​Articles of Incorporation, restated and submitted by Ferry Beach are approved by the State of Maine. Boardwalk near the Quillen building at the end of Ferry Park Avenue washed out to sea. Plans to put ADA boardwalk on the Morris side of the campus. Renovation of the Pavilion in the Grove. Almost complete redo except for the foundation. All walls, roof and fireplace removed and replaced. Added a sound system to the chapel in the Grove. Electrical in Grove replaced in B-C areas with new box and local boxes at each campsite. Ecology School leaves at the end of 2018. They removed trees, bushes and shrubs from the garden along with greenhouse, storage house and other plantings. ​Kelley Cottage office that had been the Ecology School office renovated for Ferry Beach staff and create a conference area for summer guests. ​Quillen Annex is removed. The addition was not built adequately and was falling off the main part of the building. Landscaping and new roof added to part of the building which houses the Dolphin Room. Nurses Cabin is turned into Art Room space as Quillen Annex is removed. Art room had been in the old kitchen in the Quillen Annex.